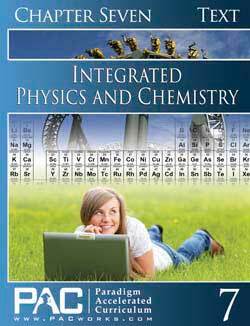 Year 1 consists of Chapters 1 through 6 for grade 9. When the student completes all 6 chapters, you can assign one credits (1 year) for Integrated Physics & Chemistry 1. 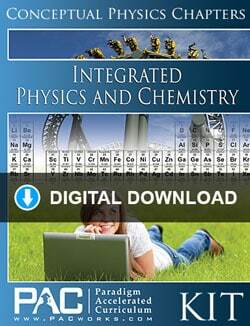 The Paradigm Integrated Physics and Chemistry 1 Digital Download Course Kit includes everything you need to complete the course in digital format: Text, Activities, and the Teacher’s Resource Kit, all in PDF format. 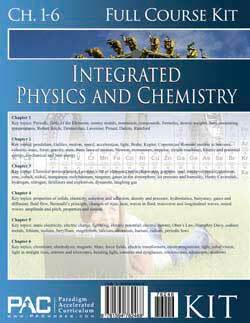 The Integrated Physics and Chemistry Year 1 Text Booklet Set includes one of each of the text booklets for Chapters 1 to 6 for the extra student. 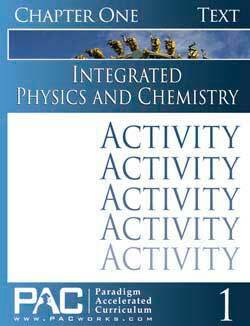 The Integrated Physics and Chemistry Year 1 Activity Booklet Set includes one of each of the activity booklets for Chapters 1 to 6 for the extra student. The Teacher’s Resource Kit for Year 1 has the Activity Keys, Quizzes, Quiz Keys, Tests, and Test Keys.